Farnese‘s Andrea Guardini took the win in a chaotic, disorganised sprint at the end of the fifth and final stage of the Tour of Qatar, but it made no difference to the overall standings. HTC-Highroad‘s Mark Renshaw was able to roll safely across the line in the middle of the lead group to claim the overall race victory. Greg van Avermaet (BMC) and Gediminas Bagdonas (An Post) broke away from the pack early on. The pair rapidly established a lead of over five minutes, sweeping up the first two places at the two intermediate sprints. Behind them, Renshaw protected his advantage over Heinrich Haussler by leaping clear of the pack to claim the one-second bonus available for third spot at each sprint point, extending his lead to eight seconds. The two leaders were eventually caught with just over six kilometres remaining, after which the pack slackened off and the peloton bunched up until Fabian Cancellara took over at the front to keep the pace up. With no team able to set up a proper lead-out, the finish became a free-for-all with riders spreading out across the entire width of the road. As Quick Step‘s Francesco Chicchi went all the way to the left-hand side of the road to open up his sprint, the first-year pro Guardini maturely left his attack until the last possible moment, pulling out of Théo Bos‘s slipstream in the last 100 metres and sneaking between the Rabobank man and the barrier on the right-hand side to win by about half a length. Victory here adds to a 2011 record which already boasts five stage wins at the recent Tour de Langkawi. He is one to watch. Behind them, Renshaw was content to sit on Haussler’s wheel, knowing that only an outright win could deprive him of the gold jersey. In the end Haussler was no threat, and the 28-year old claimed the first major stage race victory of his career. The last day was really a question of staying in the pack and making sure I stayed close to Haussler and at the head of the field. The last two laps of this stage were a bit of a blur, I was going through riders right and left and just trying to follow Haussler. With 500 metres to go I managed to get out of the pack, but with 200 metres to go I knew all I had to do was stay there and win the race. Victory brought a good end to a week which had started dismally for HTC-Highroad, as team leader Mark Cavendish suffered bad cuts and scrapes in a prologue crash which clearly affected him for at least a couple of days afterwards. Ellen van Dijk of the HTC women’s team had already won the ladies’ race last week. British riders Roger Hammond (Garmin-Cervélo) and Jeremy Hunt (Sky) finished fifth and sixth overall, while Bradley Wiggins ended up 31st, happy to have put some racing miles in his legs as he gears up for the major spring races. And that’s it for the tenth Tour of Qatar, a geographically flat and featureless race enlivened by the influence of heavy winds which regularly caused the peloton to fracture and required the riders to be alert at all times. Congratulations to Mark Renshaw, and it has also been good to see the return to form after injury of both Haussler and Tom Boonen, and the emergence of the 21-year old Guardini, who looks to be quite a prospect for the future. Like a hot potato being passed from person to person, the race leader’s gold jersey at the Tour of Qatar has changed hands on each of the last two days. With just tomorrow’s final stage to come, it is now HTC-Highroad‘s Mark Renshaw who heads the general classification by six seconds from double stage winner Heinrich Haussler of Garmin-Cervélo. Here is a quick recap of the last two days. Heinrich Haussler claimed a second successive stage win and wrested the gold jersey from Quick Step‘s Tom Boonen as he eased to victory in Mesaieed on yet another windy day which made life difficult for the riders. After a relatively still stage two, strong winds played a significant role here. Six riders eventually managed to escape from the main pack as they struggled into a heavy headwind, quickly building an advantage of over 12 minutes. Crosswinds then shattered the peloton, with all the key players safely ensconced in the front chase group. The leaders were eventually caught with around 50km to go. 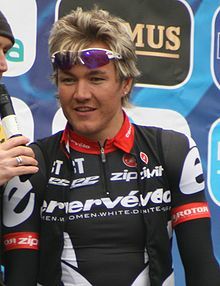 Haussler won for the second day in a freed itself from the front of the peloton as the Qatar wind split it to pieces. Overnight race leader Boonen was then dropped after he punctured and was unable to bridge the ensuing gap, hampered by the crosswind. A lead group of 30 riders went clear to fight it out to the finish. With four kilometres to go, Astana‘s Simon Clarke launched a long solo attack, which was not reeled in until inside the final kilometre, setting up the final sprint. Mark Renshaw made the first move, but Haussler sat on his wheel and then charged around the outside of him in the final 100 metres, holding off both his fellow Aussie and Daniele Bennati. Haussler’s advantage was comfortable enough for him to be able to sit up in celebration as he crossed the line. At the team meeting last night, we had a look at the wind on the internet for the rest of the week. We knew that today was pretty much the final day to do something, so we treated it as a one-day race. It was the last stage where we could make up some time on GC, and we ended up getting the stage win, the yellow jersey and the points jersey, so it all went really well. Britain’s Jeremy Hunt and Roger Hammond finished with the lead group and moved up to fifth and seventh in the overall standings, while Hunt’s Sky teammate Juan Antonio Flecha edged into fourth, 18 seconds behind Haussler. Boonen lost more than three minutes and dropped to 14th, 3:11 behind. Mark Renshaw relieved his compatriot Heinrich Haussler of the gold jersey after just one day when he edged out Daniele Bennati and Tom Boonen in the sprint to win stage four at Al Kharaitiyat. Yet again, crosswinds made life difficult for the peloton, causing it to fracture on several occasions. With just over 12 kilometres to the finish, Rabobank‘s Maarten Tjallingii tried a solo attack and was allowed to get 20 seconds ahead of the peloton before a concerted push by Sky brought him back just inside the six kilometre mark. Sky team leader Bradley Wiggins then had a go himself, being briefly joined by prologue winner Lars Boom, before HTC-Highroad’s Bernhard Eisel brought what was left of the lead pack – now numbering around 20 riders – back up to them. Leopard-Trek‘s attempted lead-out for Bennati fizzled out, leaving the main contenders to fight it out among themselves. Boonen, who had been hanging slightly back, was the first to attack, but Renshaw felt him coming and responded to the move, catapulting himself nearly a length clear at the finish. Bennati edged out Boonen for second, with Haussler a distant fourth. With the overnight leader missing out on the sprint bonuses, Renshaw’s win moved him from four seconds behind to six ahead of Haussler heading into tomorrow’s final stage. I had the good fortune to be well placed in the sprint behind Bennati and I kicked on at the right time. This win is a huge boost to my morale. Ever since I got married [this winter] I’ve been training really hard, so this win is dedicated to my wife who’s had to put up with all of that and who’s been very forgiving. It’s going to be a really nervous day, there’s 16 seconds on offer so we’ll have to play things tactically. There are three strong teams here, so it’s a matter of watching our rivals closely and making sure we don’t make any mistakes. Roger Hammond (Garmin-Cervélo) leapfrogged fellow Brit Jeremy Hunt (Sky); the pair are now fifth and sixth. 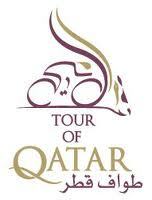 Daily live coverage and highlights of the Tour of Qatar are being broadcast by British Eurosport and Eurosport 2. Tom Boonen won for the 18th time at the Tour of Qatar, catching his rivals by surprise to claim an easy win at Al Khor Corniche and taking over the race lead from Lars Boom. In windy conditions, a break of 18 riders formed early in the stage. They had to work hard to establish a decisive advantage, but eventually with most of the major teams represented in the escape group the peloton lost interest in chasing them down. Boonen, who was supported in the breakaway by Quick Step teammates Nikolas Maes and Gert Steegmans, timed his attack perfectly. He launched his sprint from well back a long way out and established a huge gap before anyone was able to respond. At the line, he held a three-length advantage over Garmin-Cervélo‘s Heinrich Haussler and HTC-Highroad‘s Mark Renshaw. Boom had initially been part of the lead group, but eventually lost contact with a reported stomach complaint. He eventually finished five minutes down in the first of four groups as the peloton shattered in the heavy winds. It was maybe the hardest thing in my career getting here in a good shape. I’m here now and I’m really happy that I could do the first stage with a victory straight away. It’s good for the morale and it shows that all the work I’ve done is paying off. British riders Jeremy Hunt (Sky) and Roger Hammond (Garmin-Cervélo) – who won a stage here in 2009 – both featured in the successful breakaway and consequently moved up to ninth and 13th overall. Stage two saw a somewhat chaotic bunch sprint as Australia’s Heinrich Haussler went one better than his result the previous day, edging out Daniele Bennati at Doha Golf Club to claim his first win in seven months. Like Tom Boonen the previous day, Haussler had missed the second half of last season with a knee injury sustained in the same multiple pile-up at June’s Tour de Suisse. The day’s breakaway of five riders at one stage built a lead of around 5:30 before the peloton rapidly reeled them, completing the catch with just over eight kilometres to go. Sky initially pulled on the front before world time trial champion Fabian Cancellara came to the front to drive the pace as Leopard-Trek sought to control the lead-out for Bennati. But in the final drag Haussler found his way through a chink of daylight between the Italian and the barrier to take the win by maybe six inches. Katusha‘s Denis Galimzyanov was third. I’ve had so many seconds here in Qatar the last two years it’s nice to get a win in. And especially after last year after things just went so bad – this year it’s good to start off in a positive way. Tom Boonen ended up sixth after two of his lead-out men punctured in the closing kilometres, but retained the overall race lead by a single second from Haussler. Mark Renshaw is third at four seconds. Britain’s Jeremy Hunt and Roger Hammond remain ninth and 13th. Rabobank‘s Lars Boom, a former world cyclo-cross champion, used his bike-handling skills to good effect to claim victory in a tricky, technical prologue around the Cultural Village in Doha to open up the tenth Tour of Qatar. The Dutch rider beat world time trial champion Fabian Cancellara by four seconds over the 2.5km circuit. The course set a short, sharp challenge to the riders, all of whom were racing on their normal road bikes rather than specialist time trial machines. With much of the circuit sprinkled with sand and consisting of granite cobbles and brick paving, the 11 turns and five roundabouts en route offered some nasty surprises for the unwary. One such casualty was Mark Cavendish. The HTC-Highroad sprinter was the penultimate man on the course, but came down on a bend just over halfway round. He added some scrapes down his left side to the existing scars from his crash a couple of weeks ago at the Tour Down Under. After gingerly dusting himself off, Cavendish soft-pedalled to the finish and suffered the ignominy of being overtaken by Quick Step‘s Tom Boonen, who had started a minute behind. Although he openly admits that he is using this early part of the season to ease himself into shape for bigger events to come, the plan would not have included him having more crashes (two) than wins (none) already. Cavendish’s teammate and Irish national champion Matt Brammeier was HTC’s highest-placed finisher, nine seconds down in tenth. Lead-out ace Mark Renshaw was a fraction behind in eleventh. Team Sky enjoyed a rather more successful day. Juan Antonio Flecha was the early leader and eventually finished fourth, five seconds down. British teammate Alex Dowsett was 0.75s further behind in sixth on his debut. Bradley Wiggins took no risks in easing his way around to 29th place. Fellow Sky Brits Russell Downing, Jeremy Hunt and Ian Stannard all looked in decent nick as they finished within 15 seconds of the overall lead. But no one – not even world champion Cancellara – was a match for Boom. 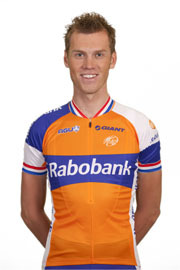 Where others were tentative on the difficult surface, the 25-year old, in his third year with Rabobank, charged round with full-on commitment. The five-time Dutch national and 2008 world cyclo-cross champion used his skill and experience over rough terrain to average 48kph as he completed the prologue in 3:07.39. Boom’s win means he adds the gold leader’s jersey to a palmarès which already includes overall victory in the 2010 Tour of Belgium and stage wins at both Paris-Nice and the Vuelta a España. It was just a shame that hardly anyone witnessed it live. The striking surroundings of the Cultural Village were all but deserted – you could count the spectators at the finish on your fingers. Tomorrow sees the first of five road stages, covering 146km from Dukhan to Al Khor Corniche, with the race finishing back in Doha on Friday. With crosswinds a constant threat on the almost uniformly flat and open roads, the peloton will need to ride aggressively to cover attacks and avoid any splits. Expect the racing to be unremittingly quick and nervy. Boonen will certainly expect to feature at the sharp end, both at stage finishes and in the overall classification. A three-time winner here (in 2006, 2008 and 2009), he looked strong in riding to seventh place in the prologue, just six seconds behind Boom, and with his compatriot and fellow Quick Step fast man Gert Steegmans just ahead of him in sixth.